LED lights are, now more than ever, the top lighting solution. They combine an energy saving of the 85% and an impressive durability (around 25 years), all in one product. In 2011 Vistosi was one of the first companies to implement this innovative resource creating the LED version of Vega, in 2011. Today its entire stand at the Frankfurt Light+Building fair is dedicated to this technology, with the display of LED lamps only. Vistosi has realized, together with the Swiss studio Atelier-Oi and as an exclusive project for Bulgari, a unique sectional lighting element, OVI, which is a new version of Angelo Mangiarotti’s Giogali. The collection includes big ceiling lamps, ‘woven’ with two-dimensional sectional blown glass hooks, which are held together by metallic rings and which form big drapes. It is a sectional and versatile system which allows the creation of the most fascinating shapes and reflections. After more than two years spent running tests, Vistosi presents an innovative crystal blend which presents clear advantages, not only aesthetical but also technological and ecological: the lead free blown crystal glass. This new blend, which no longer includes lead oxide, enhances the crystal’s transparency, which can be seen with the naked eye, and allows a significant reduction of the oxidizing processes. The result is a glass which possesses the qualities of stainless steel, in terms of durability and maintenance of its original characteristics. Vistosi is on Facebook, Twitter, Pinterest and Linkedin with news and ideas, in order to be always close to those who follow and look for it. Vistosi NoLimits is the area where designers, architects and contractors can present their ideas, which will be judged by a commission composed of marketing, design, engineering and communication experts. This selection process allows to pick up the most interesting projects, which will receive Vistosi’s endorsement for their research and production. Among the finest decorations of Vistosi’s collections there is the ‘filigrana a reticello’. In Assiba it is part of a complicated processing of nets trapped into the glass, which later on is blown with a cold working. The handicraft needed to achieve this effect make of Assiba an extremely elegant and valuable object. With the shimmering chrome plating, Cloth provides a double effect: from a metallic lamp when it is off, to delicate honey reflections when it is on. Extremely versatile. The page MyVistosi is an effective 24/7 work tool: its real time updates allow you to choose products, monitor the status of your purchase, check the open promotions, request estimates for customized items. Whether aimed at the contractor or the retail market, Vistosi chose a series of communication channels to talk about and promote its products. The video-interviews with the designers, the documentaries about the glass factory production, together with the daily presence in the social media and the opportunity to display all products in 3D, contribute to get the brand closer to the public. 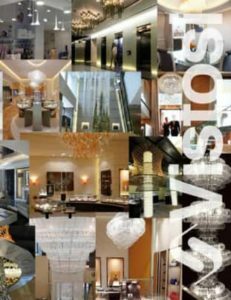 In order to make sure that its clients purchase a unique object, Vistosi has always patented its decorative models, finishes and treatments. During the enhancement of this process of quality protection, in 2010 the company introduced the branding of its products. Vistosi also looks at technical materials which coexist with blown glass in a modern conception of interior design. Ono Luce and Nerocarbonio enter the Vistosi group, providing new ideas and proposals. Rina is the result of a long research on the chemistry of materials that allowed to apply the renowned ‘Murrine’ technique to big-sized items. The symbol of the Murano glass tradition meets the simplicity of the shapes. Following the new trends in the material development sector, Vistosi tests and introduces new surface treatments in its production process, in order to achieve unique textures. The precision sandblasting used for Chimera09 is an example of that. Designed by Sergio Misserotti, the new premises of the company are inaugurated. The fine lines and the quality of materials reflect the character of the Vistosi brand. The research and testing lab is the core of Vistosi’s innovation: here processes, treatments, finishes and assemblies are born, in order to be patented and introduced in the production process. From the collaboration with the big fashion and design brands derive tests and customized products: Porro, Feg, Bulgari, Gucci are just some of the most recent Vistosi’s partnerships. For an efficient business organization Vistosi relies on technology and experience: the first is at the basis of mechanized processes such as the automatic compilation of price lists, while the second is the area of the design, interior design and architecture consultants who collaborate with the brand. Vistosi’s success is celebrated with a special event: agents and clients go on a cruise in the Mediterranean. A great celebration with those who contributed to reach this goal. The presence of alexandrite in the glass blend creates a colour changing effect that gives the lamp, when exposed to a fluorescent light, a purple-blue shade. The effect is remarkable and perfect for elegant spaces. First participation in the Compasso D’Oro competition: Diadema, designed by Romani & Saccani, is pointed out by the Design Index for its unique processing technique, the tube drawing and the finishes (patented by Vistosi). Vistosi receives the Eurispes award for Excellent Company, among the first 100 in Italy and from all business sectors. Vetreria Vistosi celebrates its 60th birthday in Venice. On the occasion Mauro Olivieri receives the first prize of the design competition for his Tease. Romani & Saccani give birth to one of Vistosi’s emblems: the drafting of the tubes, exclusive and patented, together with the quality of the materials, make of Diadema a unique creation, with no equals on the market. At Torre Branca the new Giogali3D hook is presented as the new three-dimensional version of the classic creation. The new hooks allow to build a crystal structure that can develop also horizontally. The Torre Branca, designed by Gio Ponti in Milan, hosts a more than 100-metre-high Giogali installation, with spectacular effects. Celebrated by Enrico Morteo with an installation of more than 8000 hooks, Giogali gets the ADI Design Index award for ‘Excellent product of the Italian lighting tradition’ of the last 30 years. Present each year at Euroluce since its creation, Vistosi wants to show that the investment in resources, energies and communication forms part of a project aimed at the internationalization of the brand: today, the 70% of its market is represented by the foreign countries. Vistosi optimizes its production, introducing the following practice and product certifications: ISO, ENEC and CE, but also UL and ETL for the foreign market. A simple yet brilliant intuition lies behind Damasco: the hot spinning technique is no longer a decoration applied to a form but the whole product. Stealing the effect to the processing of mirrors, Vistosi applies the silvering technique to the three-dimensional shapes of its lamps. The results are reflecting versions of its products, perfect for the decoration of the most technical and minimalist spaces. Poc’s uniqueness derives from the processing of the membrane which traditionally was applied to vases in Murano. The decorative effects of its glass are the surprising result of the cooperation between the crafts’ traditional skills and the beauty of an essential design. Thanks to an exclusive robot that solves the problem of the different thicknesses of the glass, Vistosi applies the ‘water jet’ cut – used for the manufacturing of flat glasses – to its three-dimensional blown glass items. Thanks to the increasingly precise and neat cuts, it becomes possible to achieve completely new shapes. At the end of the 20th century Vistosi decides to focus on the foreign market and acquires brands that already have a strong commercial base abroad. The products made by brands such as Alox, Triade and G2 are included in Vistosi’s catalogues. Vistosi’s blown glass is produced with a unique blend. Once reduced sodium to a minimal amount, the glass seems to acquire the characteristics of steel: it is resistant and does not get opaque with the passing of time. The handcrafted made of every single piece is unveiled by imperceptible differences on the surface. Matteo Moretti, Giancarlo’s son, works for the relaunch of the Vistosi brand, operating a deep reorganization of the production and commercial sectors and including new designers and creatives in the team of the traditional collaborators: Chiaramonte and Marin, Michele De Lucchi, Mauro Olivieri are some of them. Giancarlo Moretti, a businessman from Murano with a long experience in the glass sector with Vetrofond and Punto Luce, acquires the prestigious brand, giving birth to Vetreria Vistosi. The successful combination between design and lighting goes on: Vico Magistretti designs Alega for Vistosi while the creations by Albert Leclerc and Ettore Sottsass jr. enter the Vistosi’s catalogues of this decade. Created by Angelo Mangiarotti’s genius, Vistosi launches the revolutionary crystal hooks with no supporting structure: Giogali. It will be an ongoing success. The decisive move towards success is to tie the production to the most famous designers of the time such as Gae Aulenti, Ettore Sottsass, Adalberto Dal Lago, etc. Under the guidance of Gino and Luciano Vistosi, Guglielmo’s grandchildren, the Vistosi production starts to focus on lighting items, achieving a considerable success. Guglielmo Vistosi, heir of the Gazzabin family, after the end of World War II opens up a new furnace in Murano. The decline of the Venetian Republic and the riots among the workforce mark a long dark period in the artistic glass production. During this century many furnaces shut down for good and the Art seems to fade. Francesco Guardi: The Departure of Bucentaur for the Lido on Ascension Day, 1775-1780. The Bucentaur was destroyed by French troops in 1798. Gio-Batta Vistosi is appointed Gastaldo dell’Arte – head of the glass makers’ guild – and becomes the delegate of the furnaces’ owners in Murano. The nickname ‘Vistoso’ appears for the first time in Gerolamo Gazzabin’s baptismal certificate. He was one of Zuane’s great grandchildren, and the nickname became part of the surname. From that moment on the creations by this Murano family are labelled as Vistosi. Through Zuane Geronimo, the Gazzabin family acquires the Al Bastian furnace, which produced blown glass. Vincenzo Gazzabin is the progenitor of the family that stands out in the sector of the Murano glass manufacturing. A refined apartment in the middle of the city. #Giogali pendant. LOOKING FOR THE FEATURED FURNITURE ABOVE ? October 19, 2018VISTOSI: Sophisticated light for sophisticated living spaces.Here’s #Giogali collection …. NEED MORE VISTOSI INFORMATION ?